Last week we asked some brave, (and some not-so-brave) souls to volunteer their services in the name of marketing to throw themselves off our infamous Gorge Swing platform, so that we could film their reactions and compile an acitivty feature video showcasing the swing, how it works, and the screams! simple, yet terrifying task ahead of them – to jump! 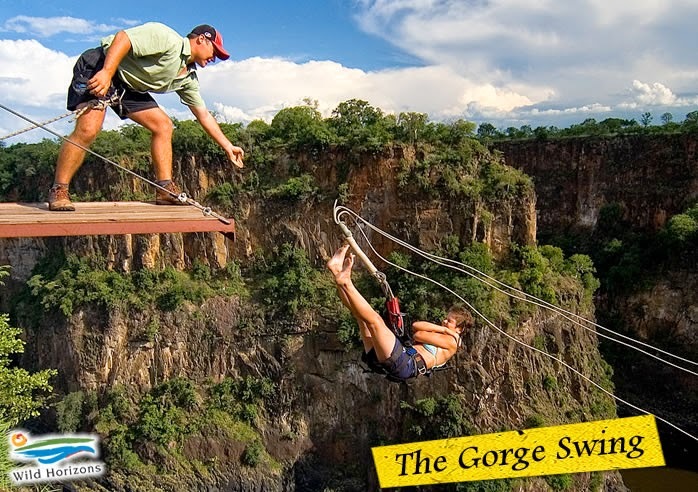 The Gorge Swing is a giant, pendulum-type swing that launches the rider into a 90m wide swing across the chasm of the gorge – AFTER a 70m freefall! It is 110% pure adrenalin, and only for those with nerves of steel! Two of the jumpers could not keep sure footing once on the platform and ended up crawling right back off in disbelief and horror. After some coaxing and encouragement from the spectators though, they were able to pluck up the courage to try again and succeed. After the swing, the feeling of conquering such an un-natural act simply has to be experienced to be believed. Check out the video below for the results of the shoot. You can book a Wild Horizons Gorge Swing by contacting us through our website here.